According to the exit polls conducted by Edison Research, Clinton won four key battleground states (NC, PA, WI, and FL) in the 2016 Presidential Election that she went on to lose in the computerized vote counts. With these states Clinton wins the Electoral College with a count of 302 versus 205 for Trump. Clinton also won the national exit poll by 3.2% and holds a narrow lead in the national vote count still in progress. Exit polls were conducted in 28 states. 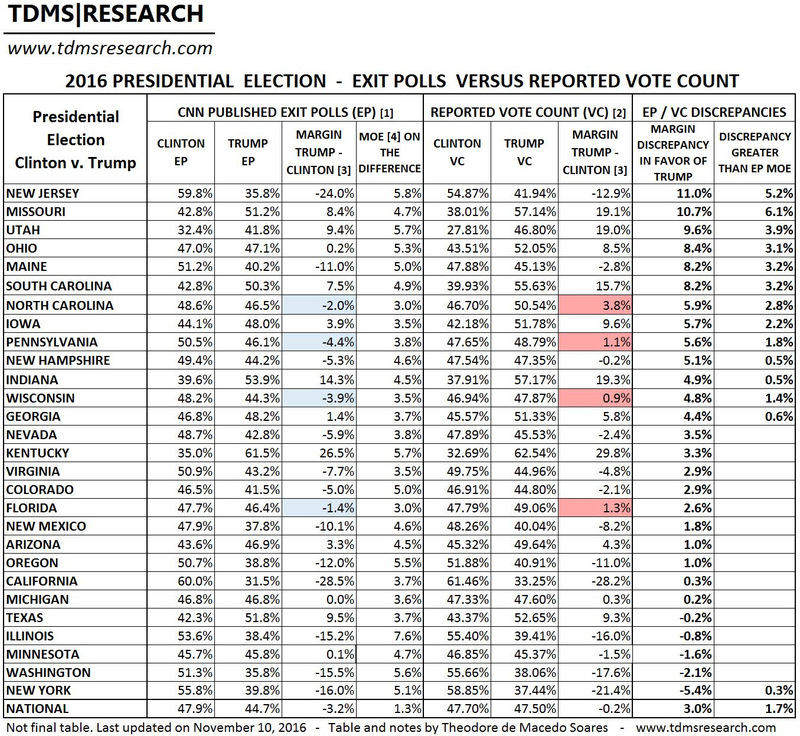 In 23 states the discrepancies between the exit polls and the vote count favored Trump. In 13 of these states the discrepancies favoring Trump exceeded the margin of error of the state. Clinton’s wins in the exit polls of four key battleground states are highlighted in blue. Trump’s wins in the computer vote counts in these same states are highlighted in red.